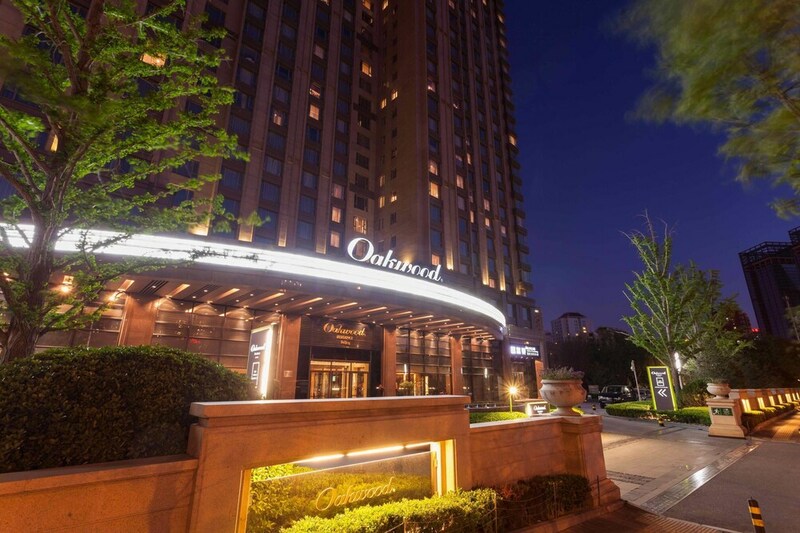 Located in Beijing (Dongcheng), Oakwood Residence Beijing is steps from Sanlitun and a 5-minute drive from Wangfujing Street. This 4.5-star apartment is 5.6 mi (9.1 km) from Forbidden City and 6.1 mi (9.9 km) from Tiananmen Square. Make yourself at home in one of the 40 air-conditioned rooms featuring kitchens with refrigerators and microwaves. Cable programming and iPod docking stations are provided for your entertainment, while complimentary wireless Internet access keeps you connected. Conveniences include phones, as well as safes and desks. Don't miss out on recreational opportunities including an outdoor tennis court and a 24-hour fitness center. Additional amenities at this apartment include complimentary wireless Internet access, a television in a common area, and tour/ticket assistance. Getting to nearby attractions is a breeze with the complimentary area shuttle that operates within 5 km. Enjoy international cuisine at Mediterraneo, one of the apartment's 2 restaurants, or stay in and take advantage of the room service (during limited hours). Quench your thirst with your favorite drink at the bar/lounge. Buffet breakfasts are available daily from 6:30 AM to 10 AM for a fee. Featured amenities include wired Internet access (surcharge), a business center, and complimentary newspapers in the lobby. Planning an event in Beijing? This apartment has 172 square feet (16 square meters) of space consisting of conference space and a meeting room. For a surcharge, guests may use a roundtrip airport shuttle (available on request) and a train station pick-up service. Oakwood Residence Beijing features an outdoor tennis court and a 24-hour fitness center. Dining is available at one of the apartment's 2 restaurants. The property also offers a grocery/convenience store. A bar/lounge is on site where guests can unwind with a drink. Wireless Internet access is complimentary. This 4.5-star property offers access to a business center and a meeting room. Event facilities measuring 172 square feet (16 square meters) include conference space. This luxury apartment also offers a terrace, a complimentary children's club, and tour/ticket assistance. An area shuttle within 5 km and a shopping center shuttle are complimentary for guests. Oakwood Residence Beijing is a smoke-free property. Mediterraneo - Overlooking the garden, this restaurant specializes in international cuisine and serves breakfast, brunch, lunch, and dinner. Guests can order drinks at the bar and enjoy alfresco dining (weather permitting). Happy hour is offered. The Princess - This restaurant specializes in Chinese cuisine and serves lunch and dinner. Recreational amenities at the apartment include an outdoor tennis court and a 24-hour fitness center. Airport shuttle service is available on request from 9:00 AM to 6:00 PM. Fees may apply. Contact the property in advance to make arrangements. Rollaway/extra beds are available for CNY 158 per day. This property offers transfers from the train station (surcharges may apply). Guests must contact the property with arrival details before travel, using the contact information on the booking confirmation. Only registered guests are allowed in the guestrooms. Parking height restrictions apply.